The chairman and five employees of a well-known English education institution called Hackers Group have been indicted without physical detention for illegally recording questions of official English tests, TOEIC and TEPS in violation of copyright law, according to a prosecutors’ announcement in Feburary. Prosecutors also indicted the group's language education and research units on the same charges. Hackers is a popular language academy franchise which accurately evaluates and predicts questions on English aptitude tests, and offers coaching to help students prepare for them better. This news shocked many people since it is the first case that exposed organized efforts to leak the questions of English aptitude tests. Cameras shaped like pens and micro-recorders were used for this mission. At first, media and netizens blamed Hackers Group for disobeying law to earn money. However, as time goes by, there are different opinions about this case. Some people began to blame Educational Testing Service instead of the Hackers Group and other people insist that students are the only true victims in this case. Let’s examine this debate further. Hackers Group is being attacked because they violated law to earn money. Critics emphasize the fact that Hackers earned 100 billion won ($89.1 million) in revenue in 2010 alone, and 36 billion won in net profit while infringing copyright law. Moreover, they say, it is ironic that Hackers Group is so sensitive about their books’ copyrights though they constantly harmed ETS’s. 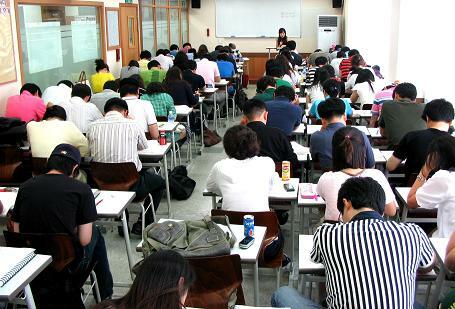 Moreover, Educational Testing Service announced that they have recently developed a TOEIC test customized for Koreans due to worries about leaked questions and the actual English language proficiency of Koreans. It cost ETS an extra seven hundred million won to produce this test. In a nutshell, Hackers took advantage of leaking questions from the TOEIC while ETS spent money to make tailored tests for Koreans and had their copyright violated by Hackers. On the other hand, some people criticize ETS for not opening their questions to the public. On a Naver bulletin board TOEIC/TEPS community, many users thought that ETS is the one who was wrong, not the Hackers Group. ‘User A’ said , “Because ETS never opens answers and questions of TOEIC, it is impossible for test takers to predict their score. That’s why many English Education Institutes like Hackers get questions illegally. I don’t think those institutes are bad. ETS is the evil one.” ‘User B’ admitted that leaking questions of English aptitude tests is not morally justifiable. However, he said that he can understand it due to the circumstances. ‘User C’ said, “ETS does not open their questions and they even continuously raise their test fees. They are deceiving customers. ” Moreover, Hackers sent an email to its customers saying they accept that their actions which leaked questions of TOEIC and TEPS were illegal. However, they said, those actions were derived from the fact that ETS never reveal answers to their tests. Hackers and ETS are not the only ones who claim themselves to be victims. Students who are studying TOEIC are also affected negatively by this ETS-Hackers case. First of all, students fear that exam questions may be totally changed because of this leak case. A few years ago, the format of the TOEIC changed completely. The difference between the old version of the TOEIC and new one is quite huge. Students expressed their worries on the board of an Internet TOEIC community. Their main concern was that their efforts might be useless if the format of test questions suddenly changes a lot. Secondly, some students, who cannot register at famous English institutes such as Hackers feel discouraged. Lee Gi-ppeum, a university student who studies TOEIC, said, “Well, the news about leaked TOEIC questions just made me think that you should register at Hackers to get your desired score as soon as possible. Isn’t it unfair to have a student to study with crucial information while another doesn’t have the information? More importantly, that information isn’t even official.’ Lastly, test takers have to take lessons in English Education Institute and take TOEIC examination even though they feel it places a tremendous burden on them. Lee said, “Students get angry when ETS raises its TOEIC fees and feel uneasy to pay for expensive lesson fees, but what can we do? We desperately need TOEIC score for good schools or companies.” That’s the reason why some people claim that students are the ultimate victims in this Hackers-ETS case. Today, Hackers English Education Institute is still busy with students who study for higher scores. Those students take TOEIC to achieve their dream job. While schools and firms continue to require high TOEIC scores as prerequisite of students and jobseekers, it continues the endless relationship among students, English institutes and ETS.